The Toyota Yaris hatchback has been given a facelift this year. Toyota also launched a special limited edition version to celebrate the car’s 20th anniversary. The exterior as a result of the facelift now resembles the Corolla Altis with a slim grille and large inserts in the bumper. Also included is the new 7S multi-drive transmission, low rolling-resistance coefficient (RRC) tyres, and LED daytime running lamps (DRL). These added features have made the already good hatchback even better. There are two variants on offer both with their own engines. The first is a 1.3-litre inline 4-cylinder engine making 98 hp and 125 Nm of torque. The other engine option is the 1.5-litre inline 4 producing 106 hp and 145 Nm of torque. With a pleasing new design and well-equipped interiors, the Yaris hatchback is still one of the best value for money cars that can be bought in the UAE today. Have a question on Yaris Hatchback? Watch latest video reviews of Toyota Yaris Hatchback to know about its interiors, exteriors, performance, mileage and more. The Toyota Yaris hatchback has been a stable seller from the portfolio of the Japanese manufacturer. It has been considered economical and reliable since its launch in UAE, and with the 2018 upgrade, the vehicle looks more mature and upmarket. 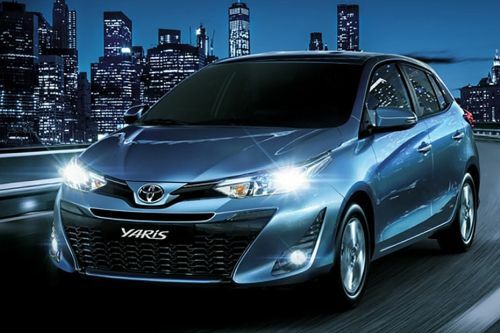 Globally, the Yaris is available in three forms - Sedan, Hatchback, and Coupe. While the Sedan version has been launched for the first time in UAE in 2018, the hatchback version has already been on sale for quite a few years. The Toyota Yaris Hatchback is a perfect blend of the size of a small car and comfort of a sedan. Overruling the odds of a small dimension, it has been able to facilitate an adequate space inside the cabin. Design-wise it has a unique styling pattern which makes it an immediate attraction. The 2018 version features sharper lines and more noticeable grille and bumpers. Keeping aside the features of the new Toyota Yaris Hatchback, there is no denying the fact that it faces a stiff competition from the likes of Ford Fiesta and Peugeot 208 in UAE. The newly designed hatchback provides a more classy look to the interiors. Wherein, the instrument panels feature three large dials that depict all the necessary driving details precisely, while the replica of circular arrangement can be seen on the uncluttered centre console. It's not just about the aesthetics, functionality is also an important ingredient that adds more to the convenience. Speaking of which, it has got spacious boots for carrying essentials, along with the door bins to store other important items. The striking bit in the interiors of the new Toyota Yaris Hatchback SE version is the multimedia system with advanced integration. The audio system supports both USB and AUX, and the steering wheel in the SE+ variant comes with audio control switches. The refreshing infotainment system adds a new dimension to the interiors, wherein the presence of infotainment features like multitasking window, customized door lock sound, rear parking with distant display view add to the usability. The exteriors of the Toyota Yaris Hatchback 2018 is an instant attraction for all four-wheeler enthusiasts, mainly due to the elegant design. Right from the uniquely designed front bumpers for promoting high air intake to the sharp headlamps with integrated clearance lamps, to LED rear combination lamps and daytime running lamps (DRL), everything about its design is appreciable. Overall, the hatchback carries a sporty outlook which will be getting you a lot of attention on the road. At the front side, the SE variant of Toyota Yaris hatchback gets a wider grille with a specific darkened insert. The colour matching theme is extended to the 16-inch alloy wheels which follow the darkened insert pattern. The easiest point of difference that one can spot in the new Toyota Yaris hatchback from its previous version is its tail lamp cluster, which is more horizontal instead of vertical and stretches inward a little more than usual. The 1.3-litre SE model rides on 14-inch steel wheels, whereas, 15-inch alloy wheels come mated to the 1.5-litre variants. The 2018 Toyota Yaris Hatchback comes with nine different paint finishing options so that you can buy one according to your taste. Its looks and delicate finishing make it one of the most appealing cars in its segment. The Toyota Yaris Hatchback 2018 UAE is available with two engine options - a 1.3-litre petrol led engine with a maximum output of 98 bhp along with a peak torque of 123 Newton metres. On the other hand, the 1.5-litre variant is capable of churning out a maximum power of 106 bhp and 140 Nm of torque. Both the 1.3-litre and 1.5-litre petrol led engines are coupled with a four-speed automatic transmission system. Talking about the acceleration of the Toyota Yaris 2018 hatchback, both the powertrains offer more than a decent performance. The 1.3-litre petrol variant can notch up from the absolute 0 to 100 kilometres per hour in just 14 seconds. Coming to the 1.5-litre variant, it takes a mere 11 seconds to tonk up from 0 to 100 kmph. Another impressive thing about this hatchback is its fuel efficiency. The Toyota Yaris Hatchback 1.3-litre variant exhibits a fuel economy of 18.8 kmpl. Whereas, the 1.5-litre variant consumes around 19.6 kmpl. When it comes to the top speed, the 1.3-litre variant knocks up a maximum speed of 165 kmph while the 1.5 alternative hits the maximum speed of 175 kmph. One of the many things that you can be sure with any model from Toyota is a comfortable and safe drive. The 2018 Toyota Yaris Hatchback comes stuffed with a number of safety features along with a good braking system. The powerful engine coupled with a more than able transmission system ensures that your drive is smooth as well as fun. The NVH is also quite decent making the drive a lot more comfortable. The Toyota Yaris 2018 Hatchback has got all the bases covered when it comes safety, as it offers much more than normal safety features and makes a natural connection with the four-wheeler enthusiasts when it comes to trusting the safety equipment. Safety features like Vehicle Stability Control (VSC), Tire Pressure Monitor Systems (TPMS) and rear fog lamps are standard in all the Toyota cars. Furthermore, safety features like Stability control, Hill start assist, Brake Assist, Electronic Brakeforce Distribution, Dual Airbags and Anti-Lock Braking system are also provided in the Toyota Yaris 2018 hatchback. this is definitely one of the best options one can go for in this segment. What is the price of Toyota Yaris Hatchback? On road prices of Toyota Yaris Hatchback in starts from AED56,700 for base variant 1.3L SE, while the top spec variant 1.5L SE Plus costs at AED65,100 .